p. : illus., ports. ; 23 cm. Hangs in Ponce de Leon Hotel, St. Augustine. By the Rev. Howard Lee, D.D. The amazing career of Henry Morrison Flagler has made the man a legendary figure. The Florida visitor hears many confusing stories of the empire builder. Some picture him as a saint; others represent him as just the opposite. Actually he was neither. All men are a composite of good and evil; so Henry M. Flagler, being a man, shared something of the same mixture in his own being. It is the purpose of this book to present, in outline, the principal facts'of his life, allowing them to speak for themselves. The Florida visitor, armed with these facts, will be enabled to evaluate the Flagler stories to be heard and read on his travels. STATUE OF HENRY M. FLAGLER in station park, St. Augustine. The tourist has occasion to ask this question often, for the Flagler name appears from one end of the state to the other. And no wonder. He was the pioneer developer who, more than any other one man, saw the vision of what the young and undeveloped state, with its unrivalled climate and rich natural beauty, might become. Having seen this vision, he invested more of his own money than any other person in bringing the vision to reality. He built hotels, roads, bridges, and railroads. Those in turn brought other men of wealth to the state. Wherever Flagler and his enterprises went new communities sprang up, industry and agriculture developed. As you ride over Florida's smooth roads, enjoy its fine resorts, or do business in its modern cities, you will know that Henry M. Flagler, son of a Presbyterian minister, partner of John D. Rockefeller in the Standard Oil Company, was the man who, more than any other, made possible the modern tourist trek to "America's Riviera". Henry Morrison Flagler was born in Hopewell, New York. His father, The Rev. Isaac Flagler, was minister of the Presbyterian Church. It was a small, rural congregation and the minister farmed during the week in order to support the family. As young Henry grew to manhood his father attempted to guide him into the same kind of life, combining the ministry with farming. Henry had his own ideas. Frustrated by the poverty he shared in the minister's home, he early promised himself to become a rich man and escape the limitations of poverty. His first step toward his ambition was his leaving home at the age of fourteen for the west; he worked his way by canal and lake boat to the Western Reserve in northern Ohio. Here among relatives of his mother he took his first job in the store of L. G. Harkness and Company in the town of Republic. He worked six long days a week; his salary was $5.00 a month and board and room. He won the full confidence of his relatives there and learned from them his principles of industry, thrift, and enterprise. These relatives were themselves men of expanding fortunes and young Flagler expanded with them. First he became manager of the store where he had begun, then he was made manager of a grain company organized by the family, his success was so marked that he was soon welcomed as a partner in the firm. By the time he was twenty-two, only eight years after he had arrived in Ohio with only a few pennies to his name, he was a full partner in a prosperous grain business, with several thousand dollars saved up, and was looking toward his marriage to Mary Harkness, daughter of the man who was his first employer. This marriage, which was welcomed by all the family, took place in Bellevue, Ohio, November 9th, 1853. The story thus far is the usual American success story: a virtuous, hard-working lad, starting with nothing works his way up to ownership, prosperity and marries the boss' daughter. But Henry Flagler tasted failure, too. In the early 1860's salt was discovered in Michigan, and many companies were being formed to produce this commodity much in demand due to the Civil War. Fortunes were being made in salt, and Henry Flagler, with $50,000 earned in his grain dealings, leaped in that direction. He formed a company in Saginaw, Michigan, investing all his savings, and began producing salt. Everybody seemed to be having the same idea, and before long failures became numerous. Flagler found that experienced producers had the advantage over him. After about two or three years of earnest effort, he gave it up when the salt prices fell at the close of the war, having lost everything he had and ending up badly in debt. He did not tarry long over this failure. Marking well the lessons it held, Henry Flagler borrowed enough money to pay his debts in Michigan, and moved to the flourishing young city of Cleveland, Ohio, to try again. Before long he had re-established himself in the grain business and was steadily making up his losses. -John D. Rockefeller. They became close friends and, as both were ambitious to be wealthy, they found great pleasure in each other's company. When Rockefeller needed new capital and new imaginative leadership in his oil company, he turned naturally to Flagler. Flagler easily found the capital and there was formed a partnership that was to result in one of America's great industrial empires and millions of dollars for its founders. The company was known as Rockefeller, Andrews, and Flagler. The years of close collaboration between Rockefeller and Flagler resulted eventually in the Standard Oil Company. Rockefeller said years later that the idea of the Standard Oil combine was born in the mind of Henry Flagler. The phenomenal growth of the oil business at this period had much to do with the Flagler success. At a time when more and more uses were being found for oil, Flagler was fortunate enough to be in the oil business. Add to that the ambition and the enterprise of both Flagler and Rockefeller and the results were only natural. The story of the questionable methods employed by many industries, railroads, and businesses to gain predominance in that era has been told often enough. The Standard Oil Company gained its position of preeminence by methods common in business at the time but since outlawed, practices that cannot be condoned by the ethical standards of our time. But this book is a record, not a judgment. The Flagler fortune grew with the oil industry and with the development of the Standard Oil Company. By 1877, ten years after his entrance into the oil business, Henry Flagler was already a rich man, but his fortune was only begun. In this year he moved with his family to New York City, the better to represent the growing company of which he was secretary and treasurer. In New York he soon won a respected place among the most progressive bankers and business executives. His boyhood ambition to be rich was achieved. took the entire family to Florida. They stayed in Jacksonville, where accommodations were poor enough; farther south there were no railroads, and few roads or hotels to serve the traveller. In Florida, Mrs. Flagler's condition improved noticeably, but Mr. Flagler grew restless away from the affairs of his business and made plans to return; he wanted his wife to remain, but she would not stay on without him. The following winter he urged Mrs. Flagler to return to Florida by herself, but she refused to go without her husband and children. Mr. Flagler felt that he could not spare the time from the business, where his efforts were piling up millions. It was not long before he realized that his wife's condition was critical. Then he tried to arrange the trip, but it was too late. He could only stand by and wait for her death, which came May 18th, 1881. Henry Flagler was stricken by his wife's passing. Their companionship had been warm and intimate for the twenty-eight years of their happy married life. Flagler, like many another before and since, understood then that riches in themselves do not bring happiness. The person he loved most was gone; the millions he had given his thought and energy to accumulate were a poor substitute. This great sorrow wrought a deep change in Flagler; from that time he began to take a belated interest in matters other than business and money. Home, family, cultural interests were given a larger share of his attention. He realized, too, that the business organization of the Standard Oil Company had (largely by his own energy and imagination) been perfected and that its work could now be carried by others, consequently he spent less and less time in the active work of the company. He remained a vice-president, a director, and one of the largest stockholders for many years, but his sorrow had taught him that there was more to life than the making of money. The next visit Mr. Flagler made to Florida was in December, 1883, when he and his new bride came first to Jacksonville and then to St. Augustine by way of the St. Johns River and the Tocoi railway. They found St. Augustine much to their liking and extended their stay through the winter. The ancient Spanish fortress-town, with its old world atmosphere and sunny climate was little known to the public; there were few hotels or other accommodations to attract visitors. Mr. Flagler saw the possibilities of St. Augustine as a mecca for honeymooners and sun-loving winter visitors. He was back again the next winter and dreams of fulfilling another boyhood ambition began to take shape. As a lad his hope was to become an innkeeper. What now was to keep him from realizing this hope? He was worth millions; his business was bringing him more wealth daily. Here in Florida was a tropical paradise to be developed and publicized. If visitors were to come and enjoy the salubrious winter sunshine there must be modern, comfortable hotels to welcome them. With that boyhood dream reborn in his mind, a new adventure had begun for Henry Flagler. itaferFlroniew' doferoel, Ponce de Leon. ro acosKngae STreet. tnahe Ponce de Leon Hotel aioral copiened toute pubic"
Mr. Flagler added two more hotels to his St. Augustine enterprises, the Alcazar and the Cordova, which opened the same season as the Ponce de Leon. The problem of transportation also attracted his attention at this period; if building materials in such huge quantities were to arrive on schedule and travellers to come in comfort, dependable rail service must be established. There was a little railroad between Jacksonville and St. Augustine; it was described as %% a streak of rust and a right of way." It is hardly likely that Flagler intended at the outset to get into railroading, but he bought this little road, and from that time on his railroad and his hotels worked hand in hand, the efficiency of one complimenting the service of the other. The popularity of Flagler's St. Augustine developments showed him the tremendous possibilities of expansion in Florida. With the urge to achieve strong within him, it was only a matter of time until rails of steel were pushed southward to serve other luxury hotels; first Ormond, then Palm Beach, then Miami at the end of the peninsula. But the Flagler imagination leaped across the Keys and to the Bahamas; before he was finished he had taken his railroad "to sea", extending the line across the Keys, clear to Key West. A steamship line was also established to serve two more Flagler Hotels at Nassau. Beginning with the thought of building one good hotel in St. Augustine, he ended with 642 miles of Florida East Coast Railway and a great system of luxury hotels from Jacksonville to the Bahamas. heFlaglertcontributionsdtoethemris of mlordr Floida rshuld noloe beac hugtesof meelfa the uildiangdo resorts. Flagler mdeepentiv ofarcueand hsswthen ecuaemn of rindstry. she was unable to capture the interest of any developer; but in that year of tragedy, when the Arctic sent its icy fingers down into an unsuspecting and unprepared Florida, the fruit and vegetable crops of hundreds of settlers in north and central parts of the state were wiped out. Public morale was shaken; settlers began deserting their homesteads and returning to the North discouraged and beaten. Many predicted that the end had come for Florida as a citrus-fruit and winter-vegetable growing state. This gave Mrs. Tuttle the occasion to appeal to Flagler; Miamri had not been hit by the freeze, growers would be safe in that area. If Flagler would extend the railroad into this area, the agriculture of the state could be saved. Flagler made a personal survey that very year, caught the vision of Mrs. Tuttle, and made plans straight way for the extension of the railway and the development of a town. The first trains began running into Miami early in 1896; it was a costly development for Flagler, but people began to pour into the new community, and he was not satisfied until he had donated land for a public school and contributed money for its construction. He also gave land for churches of the several denominations and helped to erect houses of worship for congregations of Baptists, Methodists, Episcopalians, Presbyterians and Roman Catholics. He provided land for municipal buildings, a city market, and public parks. Flagler, always interested in families and homes, helped many settlers who had been frozen out to reestablish themselves and build homes. The city of Miami, largest in the state today, owes its birth and development, as do so many other communities in Florida, to the vision, generosity, and public spirit of Henry M. Flagler. THE SANCTUARY OF MEMORIAL CHURCH. Though Henry Flagler revolted against the poverty he had known in "the manse," he never had anything but affection for his minister father and devout mother. And though he left his home at only fourteen, he took with him the habits of worship and prayer he had learned there. He was a Presbyterian by upbringing and conviction, and it is recorded that even from his earliest days away from home he established habits of regular church attendance. turing business, along with his wife, was a member and regular attendant of the First Congregational Church. The records of that church show that he was superintendent of the Sunday School also. In Cleveland he and his family were affiliated with the Old Stone Presbyterian Church; here, too, he taught in the Sunday School. These habits of faithful church attendance continued throughout his life, and among his closest friends were many ministers. Flagler was a generous supporter of all churches. Though he was a Presbyterian, his gifts and interests were not confined to any one denomination. As already stated, he helped churches of the several faiths to acquire favorable sites and build houses of worship. In Palm Beach he provided an undenominational church, Poinciana Chapel, to serve the winter visitors. Mr. Flagler himself worshipped there in his latter days when he made his home in Palm Beach. In St. Augustine he erected the Grace Methodist church, a fine Spanish design, and gave it to the congregation in exchange for a small lot they owned. Through his generosity the Catholic Cathedral in St. Augustine was rebuilt and the Baptist church erected. To the end of his life he aided many churches, large and small, with his generous contributions. The outstanding evidence of his churchmanship undoubtedly is the inspiring Memorial Presbyterian Church in St. Augustine. The impressive story of this church is told in the latter part of this book. Flagler's personal life bore evidence of his Christian convictions. For example, in his early business career, the grain firm in which he was a partner, had branched out into the distillery business. This was in the 1850's, long before the temperance movement had arisen, and the whiskey business was thought entirely respectable. But Henry Flagler had been taught by his minister father the evils of the liquor traffic. He was not comfortable as a partner in that business and welcomed the opportunity to withdraw from it. He was personally an abstainer from alcohol and lost no opportunity to discourage its use. Men who worked closely with him, report that in all their years in his company they never heard him use anything but clean language. Profanity was no part of the man. Though he suffered blunders from many of his associates and employees, he was noted for his quiet self-control and his kindness and consideration toward others. Another example of his religion in action is his generosity toward people in need. It was not easy to discover where his hand had helped; he preferred to remain anonymous. One story is told that he handed the Rev. Dr. John R. Paxton, his New York pastor, a check for $100,000 on one New Year's day, a holiday gift for charity. The pastor might use it at his discretion, the only condition being that no one should know the source of the gift. During one of the big freezes in Florida, in the nineties, Flagler dispatched one of his trusted employees to the blighted area with orders to spend $200,000 (and more if necessary) to help the suffering, saying, "I would rather lose it all, and more, than to have one man, woman or child starve." Modesty was another virtue of Henry Flagler. One of his employees, who knew him well, once said, "I should say that he is the most modest man in the world," and then related how the people clamored to change the name of Miami to Flagler, but Flagler himself would not permit it. Another evidence of this surprising modesty, is the fact that the officers of Memorial church were forced to wait until a meeting when he was not present in order to vote to Flagler his favorite pew (#20) in perpetuity. Flagler's hard Work and tremendous expenditures in Florida, when he might have comfortably retired, sprang from his religious principles. True to his Calvinist upbringing, he believed in work as a virtue. To the end of his active life he worked six full days a week. Another Calvinist belief is that wealth is a trust from God, and a man of wealth is but a steward, a trustee; the wealth belonging actually to God, the steward is obligated to use it to the glory of God and the good of men. Thus Flagler saw Florida as the opportunity to use the great wealth that had been entrusted to him in helping others. "I have come to the conclusion," Flagler once said, "'that the best way to help others is to help them to help themselves." This he did in Florida. Opening the state for recuperation and recreation, he opened the way for settlement and cultivation of the land. Profit was not his motive; he already had more millions than he could spend, and few of his ventures held promise of paying a return. The railroad, for example, on which he spent many millions to the benefit of the state, returned little if any profit to him. Near the end of his days, Flagler said to a friend, "If it wasn't for Florida, I'd be quite a rich man today." Indeed he might well have been "rich as Rockefeller" except for his liberal investments in Florida, "helping others to help themselves." To point to these characteristics is not to argue his perfection. Henry M. Flagler had faults and sins, as all men have. But the religion he learned in the Christian home of his childhood was a guiding light through the many chances and changes of a great career and drew him always to the fellowship of the Church and to Him who is the Saviour of all. She began having the wildest delusions, claiming that the Czar of Russia was secretly in love with her and that she had communications with him through the Ouija board. The counsel of the best doctors and specialists in mental disease was enlisted, but to no avail. Except f or one or two brief intervals, she grew progressively worse, and was, after all else had failed, committed to the insane asylum. Within a few years her state had so far advanced that all hope for a recovery was given up, and she was pronounced by clinic and court incurably insane. With her mind entirely gone, there was no longer any means of communication between them, and Mr. Flagler never saw Alice again after her final commitment in 1897. Another great sorrow had befallen the wealthy Flagler, and money had no power over it. He provided every possible comfort and care for his deranged wife, even settling a large sum on her private estate, which at her death at the age of eighty-two in 1930 amounted to $15,000,000. After several years of loneliness, Flagler sought a divorce. His legal home had been in New York, where the law did not allow divorce on the ground of insanity; nor did the law of his adopted state. But Flagler had many influential friends, and in consultation with them, it was suggested that the Florida law might be changed. Consequently, a bill was introduced in the state legislature proposing to make incurable insanity a ground for divorce. It became law on April 25th, 1901. The Flagler divorce was granted August 13th, 190 1. Today, when easy divorces on the flimsiest grounds are quickly granted in several states, it is difficult to see how this action would have caused more than passing comment. As a matter of fact, it precipitated a public scandal and brought an avalanche of criticism and vilification down upon Flagler. On August 24th, 1901, he married Mary Lily Kenan in Kenansville, North Carolina. One often hears the statement that Flagler's divorce law was repealed the day following his divorce; like many such stories, this is entirely false. Actually the law remained on the books for several years, being repealed in 1905. In St. Augustine Flagler had erected a fine home, "Kirkside," next to Memorial Church; it was designed in good taste, Georgian Colonial in style. Following his marriage to Mary Lily Kenan he built another home in Palm Beach. "Whitehall" was a lavish marble palace, in keeping with the desires of his new wife. To the end of his life, ten years later, he called this his home. But, although he had spent more than two and a half millions in building it, and had brought its furnishings and art treasures from the far corners of the earth, the aging millionaire found little real happiness there. Mrs. Flagler, a woman of charm and talent, established herself as an arbiter of society and fashion; she entertained the elite in an elaborate manner. The crowds of people began to tire Flagler, and gradually these big affairs were given up; Mrs. Flagler centered her social life outside her home and only a few close friends were guests at Whitehall. across the islands to Key West. A mammoth celebration was held there in his honor. The railway operated trains over this route for more than twenty years, though it was never a profitable run. In 1935 a disastrous hurricane so damaged the road that its operation had to be suspended; now it has been converted into the Overseas Highway that bears auto traffic to the southernmost city in the United States. His earthly ambitions achieved, Flagler lived little more than a year. He passed from this life at the age of eighty-three on the morning of May 20th, 1913, in Palm Beach. His estate was valued at $100,000,000. He was returned for burial to St. Augustine, according to his wishes. St. Augustine had been his "first love" in Florida and remained uppermost in his affections. Here he had built the now-famed Memorial church; adjoining it was the mausoleum where his first wife, Mary Harkness, and their daughter, Jennie Louise, and her baby, slept. Here, beside them at Memorial Church, Henry M. Flagler was laid to rest. A train on the "Railroad that Went to Sea." Isaac and Elizabeth Caldwell Flagler. Company; his first business venture. daughter of his first employer. heavily in debt. Flagler's first and only business failure. Removed to Cleveland, Ohio, and re-entered the grain business. Mrs. Flagler, who came seeking health. York; they came to Florida in December, remaining in St.
Augustine until March 1, 1884.
on the Ponce de Leon was begun. died at sea aboard the Benedict family yacht, Oneida. the extension southward of the Flagler railroad. 1896-Flagler built railroad on to Miami. 1901-Flagler granted a divorce from Ida Alice on August 13th. On August 24th he married Mary Lily Kenan of North Carolina. laid to rest, as he had requested, in the family mausoleum adjoining Memorial Presbyterian Church in St. Augustine. January 2, 1830-May 20, 1913.
the expectations of everybody, even of Mr. Flagler. 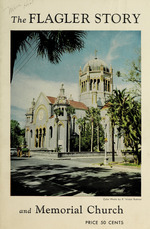 01 /'Memorial Presbyterian Church, St. Augustine, was erected in memory of her. Charleston, S. C., March 26The yacht Oneida from New *York steamed into Charleston harbor today with her colors at half mast. Mr. H. M. Flagler and other members of his family arrived here from St. Augustine on Monday to await her arrival, expecting his daughter, Mrs. H. T. (sic) Benedict and other members of the family. As soon as the yacht was signalled, Mr. Flagler engaged a launch and boardered (sic) her as she came across the bar, only to find the dead body of his daughter lying in the cabin. Mrs. Benedict died about 3 o'clock Monday afternoon, just as the yacht had sighted Morris Island lighthouse. There were on board her husband and brother, Dr. Shelton, a New York Homeopathic physician and three trained nurses, all from New York. Mr. Benedict is the son of E. C. Benedict, a well known New York banker. Mrs. Benedict was very ill when she left New York, and the sea voyage had been recommended as a last resort. By a singular coincidence, she died just about the time her father, Mr. Flagler, reached this city. Mr. Flagler is the owner of the famous Ponce de Leon Hotel in St. Augustine. The Oneida came up to the city about 2 p.m., and there was met by an undertaker, who at once embalmed the body, which was placed in a casket. The party left here tonight for New York on a special train over the Atlantic Coast Line. The Oneida will remain here for several days, at least until after the funeral, when her owner, Mr. E. C. Benedict, is expected to join her for a cruise to the West Indies. The sad event elicited much sympathy here. The flags on the shipping were lowered to half mast and many floral offerings were sent to the family at the hotel. The Captain of the Oneida says that every effort was made to reach the city when the death of Mrs. Benedict was seen to be approaching, and that she made at least twenty miles an hour. The unfortunate lady, however, breathed her last just as the historic walls of Fort Sumter were beginning to show above the horizon. The cause of death in the physician's certificate is described as intermittent fever. Mr. Flagler bore a heavy heart, for he had loved his daughter dearly; there was so much about her to remind him of her mother, his beloved wife, Mary Harkness. Again he was impressed by the impotence of his money. Only God had power to comfort and encourage in the presence of such a sorrow. When Flagler returned to St. Augustine, the city he had fostered was experiencing such growth that the little First Presbyterian Church was seeking to expand its facilities. This gave Mr. Flagler opportunity to offer a new church edifice as a memorial to Jennie Louise. The officers of the church agreed and, as always with Flagler, plans were set in motion at once. The architects, Carrere and Hastings, now famous for their work on the Flagler hotels, were commissioned to do their utmost in creating a living memorial, an inspiring church which would help many generations of men toward God and the good life. The amazing designs came quickly, as if by inspiration. The contractors, McGuire and McDonald, now Flagler's official builders, began their work at once. Materials and furnishings were ordered from distant lands. It is difficult for the modern observer to conceive that, in that day before rapid transportation and modern building methods, the great church was completely finished and furnished in less than a year following the death of Flagler's daughter. Memorial Church was dedicated with solemn and auspicious ceremonies on March 16th, 1890. St. Augustine was at the height of another gala season; visitors had watched the church in process of building, and the day of dedication was eagerly awaited. Mr. Flagler had made elaborate plans for the opening service; he brought his old friend and pastor, Dr. John R. Paxton, of West Presbyterian Church of New York City, his famous choir, and organist by special train for the occasion. Several other distinguished ministers from distant cities were present and took part in the several services of the day. The Rev. E. K. Mitchell, pastor of the church, offered the prayer of invocation. In the course of his sermon on "The Lord's Prayer", Dr. Paxton referred to the new church as "a house of prayer beautiful enough to move a savage's wonder or make an atheist pray." The church was crowded to the doors with people of all stations and walks of life, among them such distinguished persons as Mrs. Benjamin Harrison, "first lady" of the land, Vice-President and Mrs. Levi P. Morton, and members of the Wanamaker family of Philadelphia. In pew number twenty sat Henry M. Flagler, his wife Alice, his son Harry, and the bereaved husband of the loved one to whose remembrance the great edifice was given. During the service, representatives of the congregation came forward and placed a silver plate bearing the inscription "Henry M. Flagler" on pew twenty where the Flagler family were seated, a token of the appreciation of the Presbyterian Church for the gift of so grand a house of worship. Memorial Church is Venetian Renaissance (transition period), the only church of that particular architectural style in America. Visitors frequently insist that it is Byzantine or Spanish. Actually it is some of these and more; one sees also traces of Romanesque, of Greek, and of Gothic. The Renaissance is an eclectic style, combining the finest features of all the established schools, and adding its own refinements. Approaching the church one is impressed by its imposing grandeur; built in the form of a Latin cross, its central Venetian dome rises more than a hundred feet in height and is topped by a Greek cross which rises more than twenty feet above the dome. It is a copper dome supported by solid masonry, octagonal in shape, and richly ornamented with elaborate capitals in old-gold and white terra cotta set in Roman brick masonry. The twentyfour arches of the dome's arcade are supported by pillars of red terra cotta. Four angle towers serve as buttresses and occupy the four corners of the transept; -their capitals likewise are embelished in red and old-gold terra cotta and yellow bricks, after the Venetian manner. The bell towers, at the front of the church, are much lower, but are more highly ornamented with intricate open designs in white terra cotta. Baptismal Font and Carved Eagle Lecter Organ and Choir Lolt above. The canopy resembles a huge shell. rich colors beneath the crest of the roof depicts a floral cross and the figure of three doves and completes the facade of the church. this same rich wood, specially imported for this church. an unusually fine specimen of Italian carving. It bears the inscription "In Memoriam-F. H. B. to J. L. B.-March 25th, 1889'I will be a God unto thee and to thy seed after thee'." The quotation is from Genesis 17:7. The baptismal font is fitted with a table top at communion seasons and from it the Lord's Supper is served. The font thus symbolizes both of the Christian sacraments. of extraordinary size and design, its leather binding richly ornQAmented with hand-wrought silver cherubim and a memorial plaque. The Bible was the gift of Dr. George G. Shelton, the New York physician who attended Jennie Louise Benedict in her last illness. Above and behind the rostrum is the beautifully carved choir screen; from this loft the organ is played and the choir sings. During the service the choir is all but invisible; the singing echoes out over the congregation as though coming down from heaven. There are three pipe organs: the original great organ, a Roosevelt, occupies the west transept; the solo organ in the north gallery, and the echo organ and chimes in the south gallery are Estey installations. All three are played from the- four-manual console in the choir loft. Experts assert that Memorial's organ is among America's finest, most noted instruments. Frequent organ recitals are given during the winter season for the inspiration and enjoyment of visitors. The distinctive stained glass windows, representing the several articles of the Apostles' Creed, were a special gift of Mr. Flagler in 1902. They are original designs and employ colorful symbols from church tradition combined with symbols from nature. The story of the windows is told in a separate chapter of this book. On the west side of the nave, beneath the windows representing the articles: "I believe in the forgiveness of sins, the resurrection of the body, and -the life everlasting" are the bronze doors and marble archway that lead into the mausoleum of the Flagler family. Here rest the mortal remains of Henry M. Flagler, pioneer developer of Florida, his first wife, Mary Harkness, their daughter, Jennie Louise, and her baby. Only three years after Florida became a territory of the United States and religious freedom was established in what had been a colony of Spain, the First Presbyterian Church was organized in St. Augustine. It was the first church of its denomination to be organized in Florida, and so St. Augustine can boast that it has "the oldest" Presbyterian Church in Florida. In June, 1824, the Rev. Dr. William McWhir, of the Presbytery of Georgia, came to "this destitute and scattered people" and gathered together those "friendly to the cause of religion and the establishment of a Presbyterian church in this city." That month saw the church fully organized, with twelve charter members and two elders, and the sacraments of Baptism and the Lord's Supper administered. After dispensing the Word of Life to the people for about ten weeks, The Rev. W. McWhir returned to his home in Georgia, leaving the new church to the care of a kind Providence. Two years later the congregation began the erection of a house of worship. The Rev. William McWhir was born in Dublin, Ireland. He was of Scottish descent and came from the "Covenanter" background. He was a graduate of the College of Belfast and was licensed by the Presbytery of that city to preach the Gospel. He came to America in 1783, settling in Alexandria, Virginia, where he became principal of the academy of which George Washington was a trustee. The Rev. Mr. McWhir was often a guest at Mount Vernon and enjoyed an intimate friendship with General Washington and his family. About the year 1793 he moved to Sunbury, Georgia, where he became head of an academy and for nearly thirty years he made his school an outstanding institution of learning. He had a reputation for high scholarship in all classical subjects and strict discipline in his school. A friendly correspondence was continued with General Washington, and in his later years, long after Washington's death, Dr. McWhir exhibited with pride his considerable collection of letters from the hand of "the Father of our country." For some years before his death at the age of ninety he lived in Savannah, preaching occasionally and otherwise serving his denomination. The organization of St. Augustine's Presbyterian church is an example of such service. The first house of worship was begun in 1826, but the small congregation was several years in raising the funds to complete the edifice. It was formally dedicated in 1830. It was built of %%coquina stone," a formation of marine shells native to Anastasia Island, quarried near St. Augustine. The church stood on South St. George Street, across from the present Lyceum building. This location was chosen as a compromise between two elders, each of whom wished the church to be within the shadow of his own house; as it was impossible to satisfy them both, the church was built half-way between,, satisfying neither of them. Through the years it was seen that both the church's -building and location left much to be desired. During the Civil War, when St. Augustine was occupied by Federal forces, the church was used for various purposes by the Union Army. When the church was reopened in 1865 it was plain that added facilities were needed. In 1870 a wooden chapel was built beside the church, principally to serve the growing Sunday School. Seven years later the chapel was moved uptown to a lot, leased from the government, on Cordova Street just behind the post office. This move made the Sunday School more accessible-and the evening preaching services more attractive. In these two buildings the congregation of the First Presbyterian Church, worshipped until March, 1890, when thle present magnificent edifice was deeded to the society by Henry M. Flagler in exchange for their properties. This trade included the old manse, an historic Spanish style house with overhanging balcony in the front and a large walled garden at the rear; this old manse had been in the center of St. Augustine's social life and many festive gatherings had been held in its pleasant garden. It stood at the corner of St. George and Hypolita streets, where Mr. Flagler erected the municipal building that same year. When the congregation moved into its new building the name of the church was changed to "Memorial Presbyterian Church" in keeping with its character as a gift in remembrance. Over the arch ofl the east door appear these words, from the 135th -Psalm: "Thy memorial, 0 Lord, is throughout all generations." The bell in the east tower and the five coquina pillars surrounding the church are relics from the old First Church. The Church House, at the north end of the church, was erected as the manse. In 1926 it was converted into a parish house, through the generosity of Mrs. Louise Wise Lewis, and a large auditorium and stage were built on. The church parlors and social rooms, class rooms and offices, nursery and kindergarten, kitchens and dining hall are located in this building. Formerly the Sunday School was held in the chapel at the northend of the church. Now all the educational and social activities center in the church house. The church and chapel are used exclusively for worship. Mrs. Lewis also purchased and gave to the church the present manse, the fine Southern Colonial home at 32 Sevilla Street, which Mr. Flagler had built about the year 1892. This is the home of the minister of the church, The Reverend W. Howard Lee. Dr. Andrew H. Anderson, a close personal friend of Mr. Flagler and f or many years a trustee of the church, made a great contribution to the benefit of the congregation when, in the 1920's he engaged acoustical engineers at his own expense to correct the bad acoustical qualities of the building. This was a major undertaking and has been a great satisfaction to ministers and worshippers alike. In 1928 the Roosevelt Organ was rebuilt and a solo organ added by special gifts from Mrs. Louise Wise Lewis, Mrs. Jessie Kenan Wise, Mrs. Graham Kenan, and Mr. and Mrs. Win. R. Kenan, Jr. The Chimes were a gift of Mrs. Carrie Patterson Slater. The windows of Memorial church were carefully planned by the Rev. John N. MacGonigle, then pastor of the church, and Dr. Andrew Anderson, who was President of the Board of Trustees; They worked in close cooperation with the artist Mr. T. Schladermundt, of New York, who was commissioned to furnish the sketches. These three men consulted the architects, Messrs. Carrere and Hastings. Great thought went into these beautiful windows, the subject and what its relation would mean to, the architecture of the church, the color of the windows and their effect on both inside and outside the church had to be weighed carefully. Dr. MacGonigle suggested that a subject symbolic of Christianity in its broader sense might well be considered. Finally the Apostles'1 Creed was chosen for the subject, inasmuch as people of all different churches worship here. The Apostles' Creed is used alike by Protestant, Catholic and Orthodox. The Venetian renaissance architecture with its narrow lancet windows made it impossible to use full pictures, so a composite 'symbolism was decided as being the best way to portray the subject. A color scheme of the ten high, narrow windows which would keep the interior of the church in a single -color tone was decided upon. The'two broader windows and the rose window were treated independently. For the illustrations of the windows two sources were used: the traditional symbolism of the church and the symbolism of nature. Trees and flowers have always been a part of church symbolism. At the base of each window there is a panel with the article of the creed that window symbolizes upon it. The window depicting the "Crucifixion" has the inscription ",'Was crucified, dead and buried;" the church symbol above it is the excelsus red cross, the purple passion flower is a symbol from nature. The passion flower is said to contain all the symbols of the Passion. The central column is a reminder of the scourging, and the spear-shaped leaf is symbolic of the weapon. The flower blooms for three days signifying the time Jesus was in the tomb. In the "Resurrection" window is an Easter cross, the church symbol, and for the nature symbol a sheaf of Easter lilies, both symbolizing the Resurrection of Jesus. The "Ascension"I window has a crown, the church symbol of victory, and nature's symbol a palm tree signifying triumph. The "Judgment" window shows the church symbol of the scales of judgment and the roll of record. The laurel is always used to depict reward or victory. The "Holy Ghost" window has the church symbol of the descending dove, and from nature there is a cluster of pink orchids known as "The orchid of the Holy Ghost." The "Holy Catholic Church" window shows the seven branched candelabra, portraying the church and the tree of wild olives, symbol of faith. The "Communion" window with the holy cup is the church symbol based on the Lord's Supper, and nature's symbol a cluster of grapes and leaves, meaning unity. "Forgiveness", is shown by the extended hand and the rays of light, and from nature the symbol of hyssop signifies absolution or cleansing from sin. The "Resurrection of the body" has the crossed palms, which is the church symbol for immortality, and from nature the Easter lilies, symbol of resurrection. The "Life Everlasting" window is symbolized by a hart drinking from a fountain, portrays the first verse of Psalm 42: "As the hart panteth after the water brooks, so panteth my soul after thee, 0 God!" The nature symbol shows the "Tree of Life", symbolic of Revelation 22:2: "The tree of life which bare twelve manner of fruits, and yielded her fruit every month; and the leaves of the tree were for the healing of the nations!" The letters on these panels were cut from opalescent glass and inserted in the windows, rather than being inscribed on the glass. 'The result is ideal, both as to the artistry of the lettering and -in the fact the inscriptions are very easily read. The rose window in the East end with the sunburst in the background is the symbol of God the Father Almighty. The rose window in the chapel is of the head of Christ taken from the scene of "The Boy Christ in the Temple", by Hoffman. The violet tone of the windows in the choir loft produces an interesting effect against the golden tone of the eight large windows in the dome. The windows were made by the Decorative Glass Company, New York. Mr. Schladermundt was an exceptionally fine artist, some of his work is also in the Library of Congress in Washington, D. C.
Shortly after completion some one remarked about the windows: "They stand for all that is highest and best; are an education and a recurring pleasure to this and will be to future generations." H. M. FLAGLER, "THE MAGICIAN"
His faith has been repaid with "Paradise." Till Time is shadowed by Eternity. Portrait of Henry M. Flagler Hangs in Ponce de Leon Hotel St. Augustine. JhsL FLAGLER STORY The amazing career of Henry Morrison Flagler has made the man a legendary figure. The Florida visitor hears many con fusing stories of the empire builder. Some picture him as a saint; others represent him as just the opposite. Actually he was neither. All men are a composite of good and evil; so Henry M. Flagler, being a man, shared something of the same mixture in his own being. It is the purpose of this book to present, in outline, the prin cipal facts of his life, allowing them to speak for themselves. The Florida visitor, armed with these facts, will be enabled to evaluate the Flagler stories to be heard and read on his travels. Statue of Henry M. Flagler in station park, St. Augustine. WHO WAS FLAGLER? The tourist has occasion to ask this question often, for the Flagler name appears from one end of the state to the other. And no wonder. He was the pioneer developer who, more than any other one man, saw the vision of what the young and undeveloped state, with its unrivalled climate and rich natural beauty, might become. Having seen this vision, he invested more of his own money than any other person in bringing the vision to reality. He built hotels, roads, bridges, and railroads. Those in turn brought other men of wealth to the state. Wherever Flagler and his enterprises went new communities sprang up, industry and agri culture developed. As you ride over Florida's smooth roads, enjoy its fine resorts, or do business in its modern cities, you will know that Henry M. Flagler, son of a Presbyterian minister, partner of John D. Rockefeller in the Standard Oil Company, was the man who, more than any other, made possible the modern tourist trek to "America's Riviera''. HIS EARLY LIFE Henry Morrison Flagler was bom in Hopewell, New York. His father, The Rev. Isaac Flagler, was minister of the Presbyterian Church. It was a small, rural congregation and the minister farmed during the week in order to support the family. As young Henry grew to manhood his father attempted to guide him into the same kind of life, combining the ministry with farming. Henry had his own ideas. Frustrated by the poverty he shared in the minister's home, he early promised himself to become a rich man and escape the limitations of poverty. His first step toward his ambition was his leaving home at the age of fourteen for the west; he worked his way by canal and lake boat to the Western Reserve in northern Ohio. Here among relatives of his mother he took his first job in the store of L. G. Harkness and Company in the town of Republic. He worked six long days a week; his salary was $5.00 a month and board and room. He won the full confidence of his relatives there and learned from them his principles of industry, thrift, and enterprise. These relatives were themselves men of expanding fortunes and young Flagler expanded with them. First he became manager of the store where he had begun, then he was made manager of a grain company organized by the family, his success was so marked that he was soon welcomed as a partner in the firm. By the time he was twenty-two, only eight years after he had arrived in Ohio with only a few pennies to his name, he was a full partner in a prosperous grain business, with several thousand dollars saved up, and was looking toward his marriage to Mary Harkness, daughter of the man who was his first employer. This marriage, which was welcomed by all the family, took place in Bellevue, Ohio, November 9th, 1853. BUSINESS SUCCESS The story thus far is the usual American success story: a virtuous, hard-working lad, starting with nothing works his way up to owner ship, prosperity and marries the boss' daughter. But Henry Flagler tasted failure, too. In the early 1860's salt was discovered in Michigan, and many companies were being formed to produce this commodity much in demand due to the Civil War. Fortunes were being made in salt, and Henry Flagler, with $50,000 earned in his grain dealings, leaped in that direction. He formed a company in Saginaw, Michigan, investing all his savings, and began producing salt. Everybody seemed to be having the same idea, and before long failures became numerous. Flagler found that experienced producers had the advantage over him. After about two or three years of earnest effort, he gave it up when the salt prices fell at the close of the war, having lost everything he had and ending up badly in debt. took the entire family to Florida. They stayed in Jacksonville, where accommodations were poor enough; farther south there were no railroads, and few roads or hotels to serve the traveller. In Florida, Mrs. Flagler's condition improved noticeably, but Mr. Flagler grew restless away from the affairs of his business and made plans to return; he wanted his wife to remain, but she would not stay on without him. The following winter he urged Mrs. Flagler to return to Florida by herself, but she refused to go without her husband and children. Mr. Flagler felt that he could not spare the time from the business, where his efforts were piling up millions. It was not long before he realized that his wife's condition was critical. Then he tried to arrange the trip, but it was too late. He could only stand by and wait for her death, which came May 18th, 1881. Henry Flagler was stricken by his wife's passing. Their com panionship had been warm and intimate for the twenty-eight years of their happy married life. Flagler, like many another before and since, understood then that riches in themselves do not bring happiness. The person he loved most was gone; the millions he had given his thought and energy to accumulate were a poor substitute. This great sorrow wrought a deep change in Flagler; from that time he began to take a belated interest in matters other than business and money. Home, family, cultural interests were given a larger share of his attention. He realized, too, that the business organization of the Standard Oil Company had (largely by his own energy and imagination) been perfected and that its work could now be carried by others, consequently he spent less and less time in the active work of the company. He re mained a vice-president, a director, and one of the largest stock holders for many years, but his sorrow had taught him that there was more to life than the making of money. The next visit Mr. Flagler made to Florida was in December, 1883, when he and his new bride came first to Jacksonville and then to St. Augustine by way of the St. Johns River and the Tocoi railway. They found St. Augustine much to their liking and extended their stay through the winter. The ancient Spanish fortress-town, with its old world atmosphere and sunny climate was little known to the public; there were few hotels or other accommodations to attract visitors. Mr. Flagler saw the possibilities of St. Augustine as a mecca for honeymooners and sun-loving winter visitors. He was back again the next winter and dreams of fulfilling another boyhood ambition began to take shape. As a lad his hope was to become an innkeeper. What now was to keep him from realizing this hope? He was worth millions; his business was bringing him more wealth daily. Here in Florida was a tropical paradise to be developed and publicized. If visitors were to come and enjoy the salubrious winter sunshine there must be modern, comfortable hotels to wel come them. With that boyhood dream reborn in his mind, a new adventure had begun for Henry Flagler. * Front view of the Hotel Ponce de Leon from across King Street. The Dome of Memorial Church at left. In March, 1885, St. Augustine celebrated the landing of Ponce de Leon; it was quite a show and a record number of winter visitors were in the city that season. Flagler was so impressed by the pageant that he determined to build a great luxury hotel in keeping with the traditions of the old Spanish city and to name it after Florida's discoverer, Ponce de Leon. He engaged Thomas Hastings, a promising young architect, in the firm of Carrere and Hastings, of New York, to draw up plans for it. Hastings also was a son of a Presbyterian minister; Flagler was a close friend of the father. The architects gave their best efforts to the project and from their work in Florida their firm gained a national repu tation. Among other noted buildings Carrere and Hastings de signed are the New York Public Library, the Metropolitan Opera (interior), the United States Senate Office Building in Washington, and the Memorial Amphitheatre in the National Cemetery at Ar lington, Virginia. The Ponce de Leon Hotel was formally opened to the public with a gala celebration January 10th, 1888. It was reputed at the time to be the finest hotel in the world. Built at a cost of two and a half million dollars, this palatial structure, with its Span ish inner-court surrounded by gracious verandas and dominated by towers that rise high above the town, immediately attracted the wealthy, the famous and the great of that day. St. Augustine became famous as a restful resort abounding in historic reminders of Spain's lost empire and savoring of far-away lands. By today's standards the Ponce de Leon Hotel is considered quite "fancy". But it remains one of the wonders of hotel architecture and attracts each winter a discriminating clientele. Mr. Flagler added two more hotels to his St. Augustine enter prises, the Alcazar and the Cordova, which opened the same season as the Ponce de Leon. The problem of transportation also attracted his attention at this period; if building materials in such huge quantities were to arrive on schedule and travellers to come in comfort, dependable rail service must be established. There was a little railroad between Jacksonville and St. Augustine; it was described as "a streak of rust and a right of way." It is hardly likely that Flagler intended at the outset to get into rail roading, but he bought this little road, and from that time on his railroad and his hotels worked hand in hand, the efficiency of one complimenting the service of the other. The popularity of Flagler's St. Augustine developments showed him the tremendous possibilities of expansion in Florida. With the urge to achieve strong within him, it was only a matter of time until rails of steel were pushed southward to serve other luxury hotels; first Ormond, then Palm Beach, then Miami at the end of the peninsula. But the Flagler imagination leaped across the Keys and to the Bahamas; before he was finished he had taken his railroad "to sea", extending the line across the Keys, clear to Key West. A steamship line was also established to serve two more Flagler Hotels at Nassau. Beginning with the thought of building one good hotel in St. Augustine, he ended with 642 miles of Florida East Coast Railway and a great system of luxury hotels from Jacksonville to the Bahamas. she was unable to capture the interest of any developer; but in that year of tragedy, when the Arctic sent its icy fingers down into an unsuspecting and unprepared Florida, the fruit and vege table crops of hundreds of settlers in north and central parts of the state were wiped out. Public morale was shaken; settlers began deserting their homesteads and returning to the North discouraged and beaten. Many predicted that the end had come for Florida as a citrus-fruit and winter-vegetable growing state. This gave Mrs. Tuttle the occasion to appeal to Flagler; Miami had not been hit by the freeze, growers would be safe in that area. If Flagler would extend the railroad into this area, the agriculture of the state could be saved. Flagler made a personal survey that very year, caught the vision of Mrs. Tuttle, and made plans straight way for the extension of the railway and the de velopment of a town. The first trains began running into Miami early in 1896; it was a costly development for Flagler, but people began to pour into the new community, and he was not satisfied until he had donated land for a public school and contributed money for its construction. He also gave land for churches of the several denominations and helped to erect houses of worship for congregations of Baptists, Methodists, Episcopalians, Presby terians and Roman Catholics. He provided land for municipal buildings, a city market, and public parks. Flagler, always inter ested in families and homes, helped many settlers who had been frozen out to reestablish themselves and build homes. The city of Miami, largest in the state today, owes its birth and development, as do so many other communities in Florida, to the vision, generosity, and public spirit of Henry M. Flagler. Flagler Memorial Monument located on an island in Biscayne Bay, Miami. turing business, along with his wife, was a member and regular attendant of the First Congregational Church. The records of that church show that he was superintendent of the Sunday School also. In Cleveland he and his family were affiliated with the Old Stone Presbyterian Church; here, too, he taught in the Sunday School. These habits of faithful church attendance continued throughout his life, and among his closest friends were many ministers. Flagler was a generous supporter of all churches. Though he was a Presbyterian, his gifts and interests were not confined to any one denomination. As already stated, he helped churches of the several faiths to acquire favorable sites and build houses of worship. In Palm Beach he provided an undenominational church, Poinciana Chapel, to serve the winter visitors. Mr. Flagler himself worshipped there in his latter days when he made his home in Palm Beach. In St. Augustine he erected the Grace Methodist church, a fine Spanish design, and gave it to the congregation in exchange for a small lot they owned. Through his generosity the Catholic Cathedral in St. Augustine was rebuilt and the Baptist church erected. To the end of his life he aided many churches, large and small, with his generous contributions. The outstanding evidence of his churchmanship undoubtedly is the inspiring Memorial Presbyterian Church in St. Augustine. The impressive story of this church is told in the latter part of this book. Flagler's personal life bore evidence of his Christian convictions. For example, in his early business career, the grain firm in which he was a partner, had branched out into the distillery business. This was in the 1850's, long before the temperance movement had arisen, and the whiskey business was thought entirely respectable. But Henry Flagler had been taught by his minister father the evils of the liquor traffic. He was not comfortable as a partner in that business and welcomed the opportunity to withdraw from it. He was personally an abstainer from alcohol and lost no opportunity to discourage its use. Men who worked closely with him, report that in all their years in his company they never heard him use anything but clean language. Profanity was no part of the man. Though he suffered blunders from many of his associates and employees, he was noted for his quiet self-control and his kindness and consideration toward others. Another example of his religion in action is his generosity toward people in need. It was not easy to discover where his hand had helped; he preferred to remain anonymous. One story is told that he handed the Rev. Dr. John R. Paxton, his New York pastor, a check for $100,000 on one New Year's day, a holiday gift for charity. The pastor might use it at his discretion, the only condition being that no one should know the source of the gift. and charm; through reading and personal contacts he gained con siderable learning and culture. Alice was unable to cultivate the quiet social graces her husband carried so naturally. She liked excitement and activity; Mr. Flagler preferred intellectual pursuits. For all that, Flagler gave every evidence of loving his wife Alice and strove to make her happy. He had a private rail road car built for their travels and named it "Alicia" for her, likewise a fine yacht was christened with the same name. He built a hospital in St. Augustine and named it for her. He made no objections to her extravagant expenditures and occasionally surprising conduct. But within ten years of their wedding it became apparent that Alice was becoming something more than merely "peculiar". She began having the wildest delusions, claiming that the Czar of Russia was secretly in love with her and that she had communications with him through the Ouija board. The counsel of the best doctors and specialists in mental disease was enlisted, but to no avail. Except for one or two brief intervals, she grew progressively worse, and was, after all else had failed, committed to the insane asylum. Within a few years her state had so far advanced that all hope for a recovery was given up, and she was pronounced by clinic and court incurably insane. With her mind entirely gone, there was no longer any means of communi cation between them, and Mr. Flagler never saw Alice again after her final commitment in 1897. Another great sorrow had befallen the wealthy Flagler, and money had no power over it. He provided every possible comfort and care for his deranged wife, even settling a large sum on her private estate, which at her death at the age of eighty-two in 1930 amounted to $15,000,000. After several years of loneliness, Flagler sought a divorce. His legal home had been in New York, where the law did not allow divorce on the ground of insanity; nor did the law of his adopted state. But Flagler had many influential friends, and in consultation with them, it was suggested that the Florida law might be changed. Consequently, a bill was introduced in the state legislature pro posing to make incurable insanity a ground for divorce. It became law on April 25th, 1901. The Flagler divorce was granted August 13th, 1901. Today, when easy divorces on the flimsiest grounds are quickly granted in several states, it is difficult to see how this action would have caused more than passing comment. As a matter of fact, it precipitated a public scandal and brought an avalanche of criticism and vilification down upon Flagler. On August 24th, 1901, he married Mary Lily Kenan in Kenansville, North Carolina. One often hears the statement that Flagler's divorce law was repealed the day following his divorce; like many such stories, this is entirely false. Actually the law remained on the books for several years, being repealed in 1905. THE FLAGLER STORY At a Glance1830Â—Henry Morrison Flagler bom January 2, 1830, in the Presby terian Manse at Hopewell, New York, son of the Reverend Isaac and Elizabeth Caldwell Flagler. 1844Â—Young Flagler left home to seek his fortune in Northern Ohio. 1844Â—Arrived Republic, Ohio, with one nickel, four cents, and a French coin as his total capital. Began working in the store of L. G. Harkness and Company at a salary of $5.00 per month and his keep. 1849Â—Moved to Bellevue, Ohio, and a new job in the grain business. 1852Â— Purchased an interest in the grain business of Harkness and Company; his first business venture. 1853Â— Henry Flagler married Mary Harkness on November 9th, daughter of his first employer. 1855Â—The first child, Jennie Louise, bom March 18th. 1865Â—Failed in salt manufacturing business in Michigan, ending heavily in debt. Flagler's first and only business failure. Removed to Cleveland, Ohio, and re-entered the grain busi ness. 1867Â—Entered the oil business in the partnership of Rockefeller, Andrews and Flagler; this venture later developed into the Standard Oil Company, and Flagler's great fortune was on the way. 1870Â—Standard Oil Company incorporated, Henry M. Flagler, Sec retary and Treasurer. A son, Harry Harkness, was bom December 2nd. 1877Â— Flagler Family moved to New York City. 1878Â— The Flagler family made their first visit to Florida. Flagler noticed need of better hotel and travel facilities so that the healing winter sunshine might be enjoyed by those, such as Mrs. Flagler, who came seeking health. 1881Â—Mary Harkness Flagler died in New York, May 18th. 1883Â—Flagler was re-married June 5th to Ida Alice Shourds in New York; they came to Florida in December, remaining in St. Augustine until March 1, 1884. 1885Â—Returned to St. Augustine and was so fascinated by the old city that he decided to build a great luxury hotel, and work on the Ponce de Leon was begun. 1888Â— The Ponce de Leon Hotel was formally opened January 10th. 1889Â— Jennie Louise Benedict, only daughter of Henry M. Flagler, died at sea aboard the Benedict family yacht, Oneida. 1890Â— Memorial Church, built by Mr. Flagler in memory of his daughter, was dedicated March 16th, within a year after her death. 1894Â—Palm Beach saw opening of the Royal Poinciana Hotel and the extension southward of the Flagler railroad. 1896Â—Flagler built railroad on to Miami. 1901Â—Flagler granted a divorce from Ida Alice on August 13th. On August 24th he married Mary Lily Kenan of North Caro lina. 1912Â—Flagler arrived in Key West aboard the first train over "the railroad that went to sea/' completing the Flagler Empire in Florida. 1913Â—Henry M. Flagler died in Palm Beach May 20th. He was laid to rest, as he had requested, in the family mausoleum adjoining Memorial Presbyterian Church in St. Augustine. Henry Morrison Flagler January 2, 1830Â—May 20, 1913. PART II. THE STORY OF MEMORIAL CHURCH The winter of 1889 found Henry M. Flagler at the peak of his career. His great Ponce de Leon Hotel had become renowned before the opening for its second season. His rebuilt railroad carried crowds of the nation's most prominent people into his new depot. Lines formed before the registers of his three St. Augustine hotels, the Ponce de Leon, the equally sumptious Alcazar, and the Cordova. St. Augustine, as a winter resort, was exceeding the expectations of everybody, even of Mr. Flagler. The winter held other promise for Flagler's happiness; his daugh ter Jennie Louise was expecting a baby. He awaited with eager ness the news that he had become a grandfather. It came on February 9thÂ— "Born a girlÂ—Margery." Almost before his re joicing could begin, however, word came that the baby had died, having lived only a few hours. Soon he had reason to be anxious about Jennie Louise herself; the mother's health did not return as expected. Her doctors advised that she be taken to Florida for a change of scene and a restful convalescence. Her husband, Frederick H. Benedict, secured his father's yacht, and, with a physician and a staff of trained nurses, they put out to sea. Days of anxious waiting followed for Mr. Flagler. He ordered a special train and went to Charleston to meet his daughter. The following news story touchingly describes the coming of another tragedy into Flagler's life. ...... Jennie Louise Benedict 1855-1889 DAUGHTER OF HENRY M. FLAGLER Memorial Presbyterian Church St. Augustine 9 was erected in memory of her. (From The Florida Times-Union, March 27, 1889) DEATH OF MRS. BENEDICT Mr. Flagler's daughter dies on Oneida near Charleston (Special to The Times-Union) Charleston, S. C., March 26Â— The yacht Oneida from New York steamed into Charleston harbor today with her colors at half mast. Mr. H. M. Flagler and other members of his family arrived here from St. Augustine on Monday to await her arrival, expecting his daughter, Mrs. H. T. (sic) Bene dict and other members of the family. As soon as the yacht was signalled, Mr. Flagler engaged a launch and boardered (sic) her as she came across the bar, only to find the dead body of his daughter lying in the cabin. Mrs. Benedict died about 3 o'clock Monday afternoon, just as the yacht had sighted Morris Island lighthouse. There were on board her husband and brother, Dr. Shelton, a New York Homeopathic physician and three trained nurses, all from New York. Mr. Benedict is the son of E. C. Benedict, a well known New York banker. Mrs. Benedict was very ill when she left New York, and the sea voyage had been recommended as a last resort. By a singular coincidence, she died just about the time her father, Mr. Flagler, reached this city. Mr. Flagler is the owner of the famous Ponce de Leon Hotel in St. Augustine. The Oneida came up to the city about 2 p.m., and there was met by an undertaker, who at once embalmed the body, which was placed in a casket. The party left here tonight for New York on a special train over the Atlantic Coast Line. The Oneida will remain here for several days, at least until after the funeral, when her owner, Mr. E. C. Benedict, is expected to join her for a cruise to the West Indies. The sad event elicited much sympathy here. The flags on the shipping were lowered to half mast and many floral offerings were sent to the family at the hotel. The Captain of the Oneida says that every effort was made to reach the city when the death of Mrs. Benedict was seen to be approaching, and that she made at least twenty miles an hour. The unfortunate lady, however, breathed her last just as the historic walls of Fort Sumter were beginning to show above the horizon. The cause of death in the physician's certificate is described as intermittent fever. Mr. Flagler bore a heavy heart, for he had loved his daughter dearly; there was so much about her to remind him of her mother, his beloved wife, Mary Harkness. Again he was impressed by the impotence of his money. Only God had power to comfort and encourage in the presence of such a sorrow. When Flagler returned to St. Augustine, the city he had fostered was experiencing such growth that the little First Presbyterian Church was seeking to expand its facilities. This gave Mr. Flagler opportunity to offer a new church edifice as a memorial to Jennie Louise. The officers of the church agreed and, as always with Flagler, plans were set in motion at once. The architects, Carrere and Hastings, now famous for their work on the Flagler hotels, were commissioned to do their utmost in creating a living memorial, an inspiring church which would help many generations of men toward God and the good life. The amazing designs came quickly, as if by inspiration. The contractors, McGuire and McDonald, now Flagler's official build ers, began their work at once. Materials and furnishings were ordered from distant lands. It is difficult for the modern observer to conceive that, in that day before rapid transportation and modern building methods, the great church was completely finished and furnished in less than a year following the death of Flagler's daughter. Memorial Church was dedicated with solemn and auspicious ceremonies on March 16th, 1890. St. Augustine was at the height of another gala season; visitors had watched the church in process of building, and the day of dedication was eagerly awaited. Mr. Flagler had made elaborate plans for the opening service; he brought his old friend and pastor, Dr. John R. Paxton, of West Presbyterian Church of New York City, his famous choir, and organist by special train for the occasion. Several other distin guished ministers from distant cities were present and took part in the several services of the day. The Rev. E. K. Mitchell, pastor of the church, offered the prayer of invocation. In the course of his sermon on "The Lord's PrayerÂ”, Dr. Paxton referred to the new church as "a house of prayer beautiful enough to move a savage's wonder or make an atheist pray.Â” The church was crowded to the doors with people of all stations and walks of life, among them such distinguished persons as Mrs. Benjamin Harrison, "first ladyÂ” of the land, Vice-President and Mrs. Levi P. Morton, and members of the Wanamaker family of Philadelphia. In pew number twenty sat Henry M. Flagler, his wife Alice, his son Harry, and the bereaved husband of the loved one to whose remembrance the great edifice was given. During the service, representatives of the congregation came forward and placed a silver plate bearing the inscription "Henry M. FlaglerÂ” on pew twenty where the Flagler family were seated, a token of the appreciation of the Presbyterian Church for the gift of so grand a house of worship. Memorial ChurchÂ’s Great Pulpit The canopy resembles a huge shell. rich colors beneath the crest of the roof depicts a floral cross and the figure of three doves and completes the facade of the church. The interior is furnished with finely carved mahogany woodwork from Santo Domingo. All the pews, panelling, and doors are of this same rich wood, specially imported for this church. From the high vaulted ceilings hang double cruciform bronze chandeliers of interlacing floral design. Bronze Venetian torchiers line the aisles. The floor is of imported Siena tile laid in Venetian pattern, relieved by twelve plaques of violet breccia marble symbolic of the twelve apostles. The great Baptismal Font is one solid piece of Siena marble, an unusually fine specimen of Italian carving. It bears the in scription "In MemoriamÂ—F. H. B. to J. L. B.Â—March 25th, 1889Â— 'I will be a God unto thee and to thy seed after thee'." The quotation is from Genesis 17:7. The baptismal font is fitted with a table top at communion seasons and from it the Lord's Supper is served. The font thus symbolizes both of the Christian sacraments. Above the font is the carved eagle lectern; upon it is a Bible of extraordinary size and design, its leather binding richly orna mented with hand-wrought silver cherubim and a memorial plaque. The Bible was the gift of Dr. George G. Shelton, the New York physician who attended Jennie Louise Benedict in her last illness. The services of worship are conducted from the lectern; the minister preaches from the pulpit at the side, its canopy simulating a huge shell. Above and behind the rostrum is the beautifully carved choir screen; from this loft the organ is played and the choir sings. During the service the choir is all but invisible; the singing echoes out over the congregation as though coming down from heaven. There are three pipe organs: the original great organ, a Roose velt, occupies the west transept; the solo organ in the north gallery, and the echo organ and chimes in the south gallery are Estey installations. All three are played from the four-manual console in the choir loft. Experts assert that Memorial's organ is among America's finest, most noted instruments. Frequent organ recitals are given during the winter season for the inspiration and enjoyment of visitors. The distinctive stained glass windows, representing the several articles of the Apostles' Creed, were a special gift of Mr. Flagler in 1902. They are original designs and employ colorful symbols from church tradition combined with symbols from nature. The story of the windows is told in a separate chapter of this book. On the west side of the nave, beneath the windows representing the articles: "I believe in the forgiveness of sins, the resurrection of the body, and the life everlasting" are the bronze doors and marble archway that lead into the mausoleum of the Flagler family. Here rest the mortal remains of Henry M. Flagler, pioneer developer of Florida, his first wife, Mary Harkness, their daughter, Jennie Louise, and her baby. The Flagler Sarcophagus Here Henry Morrison Flagler sleeps beside his loved ones. ORGANIZED 1824 Only three years after Florida became a territory of the United States and religious freedom was established in what had been a colony of Spain, the First Presbyterian Church was organized in St. Augustine. It was the first church of its denomination to be organized in Florida, and so St. Augustine can boast that it has "the oldest" Presbyterian Church in Florida. In June, 1824, the Rev. Dr. William McWhir, of the Presbytery of Georgia, came to "this destitute and scattered people" and gathered together those "friendly to the cause of religion and the establishment of a Presbyterian church in this city." That month saw the church fully organized, with twelve charter members and two elders, and the sacraments of Baptism and the Lord's Supper administered. After dispensing the Word of Life to the people for about ten weeks, The Rev. W. McWhir returned to his home in Georgia, leaving the new church to the care of a kind Providence. Two years later the congregation began the erection of a house of worship. THE FOUNDER The Rev. William McWhir was bom in Dublin, Ireland. He was of Scottish descent and came from the "Covenanter" back ground. He was a graduate of the College of Belfast and was licensed by the Presbytery of that city to preach the Gospel. He came to America in 1783, settling in Alexandria, Virginia, where he became principal of the academy of which George Washington was a trustee. The Rev. Mr. McWhir was often a guest at Mount Vernon and enjoyed an intimate friendship with General Wash ington and his family. About the year 1793 he moved to Sunbury, Georgia, where he became head of an academy and for nearly thirty years he made his school an outstanding institution of learning. He had a repu tation for high scholarship in all classical subjects and strict disci pline in his school. A friendly correspondence was continued with General Wash ington, and in his later years, long after Washington's death, Dr. McWhir exhibited with pride his considerable collection of letters from the hand of "the Father of our country." For some years before his death at the age of ninety he lived in Savannah, preaching occasionally and otherwise serving his denomination. The organization of St. Augustine's Presbyterian church is an example of such service. BUILDINGS The first house of worship was begun in 1826, but the small congregation was several years in raising the funds to complete the edifice. It was formally dedicated in 1830. It was built of "coquina stone," a formation of marine shells native to Anastasia Island, quarried near St. Augustine. The church stood on South St. George Street, across from the present Lyceum building. This location was chosen as a compromise between two elders, each of whom wished the church to be within the shadow of his own house; as it was impossible to satisfy them both, the church was built half-way between, satisfying neither of them. Through the years it was seen that both the church's building and location left much to be desired. During the Civil War, when St. Augustine was occupied by Federal forces, the church was used for various purposes by the Union Army. When the church was reopened in 1865 it was plain that added facilities were needed. In 1870 a wooden chapel was built beside the church, principally to serve the growing Sunday School. Seven years later the chapel was moved uptown to a lot, leased from the government, on Cordova Street just behind the post office. This move made the Sunday School more accessible and the evening preaching services more attractive. In these two buildings the congregation of the First Presbyterian Church worshipped until March, 1890, when the present magnificent edifice was deeded to the society by Henry M. Flagler in exchange for their properties. This trade included the old manse, an historic Spanish style house with overhanging balcony in the front and a large walled garden at the rear; this old manse had been in the center of St. Augustine's social life and many festive gatherings had been held in its pleasant garden. It stood at the comer of St. George and Hypolita streets, where Mr. Flagler erected the municipal building that same year. When the congregation moved into its new building the name of the church was changed to "Memorial Presbyterian Church" in keeping with its character as a gift in remembrance. Over the arch of the east door appear these words, from the 135th Psalm: "Thy memorial, O Lord, is throughout all generations." The bell in the east tower and the five coquina pillars surrounding the church are relics from the old First Church. The Church House, at the north end of the church, was erected as the manse. In 1926 it was converted into a parish house, through the generosity of Mrs. Louise Wise Lewis, and a large auditorium and stage were built on. The church parlors and social rooms, class rooms and offices, nursery and kindergarten, kitchens and dining hall are located in this building. Formerly the Sunday School was held in the chapel at the northend of the church. Now all the educational and social activities center in the church house. The church and chapel are used exclusively for worship. Mrs. Lewis also purchased and gave to the church the present manse, the fine Southern Colonial home at 32 Sevilla Street, which Mr. Flagler had built about the year 1892. This is the home of the minister of the church, The Reverend W. Howard Lee. St. Augustine's First Presbyterian Church 1830-1889 OTHER DONORS Through the years many members and friends of Memorial Church have made their special contributions in devoted service and memorial gifts. Of especial interest in connection with this book are the following: Dr. Andrew H. Anderson, a close personal friend of Mr. Flagler and for many years a trustee of the church, made a great contri bution to the benefit of the congregation when, in the 1920's he engaged acoustical engineers at his own expense to correct the bad acoustical qualities of the building. This was a major under taking and has been a great satisfaction to ministers and worship pers alike. In 1928 the Roosevelt Organ was rebuilt and a solo organ added by special gifts from Mrs. Louise Wise Lewis, Mrs. Jessie Kenan Wise, Mrs. Graham Kenan, and Mr. and Mrs. Wm. R. Kenan, Jr. The echo organ was presented by Hulda Lyon Smith and Susan Davenport Lyon. The Chimes were a gift of Mrs. Carrie Patterson Slater. MEMORIAL CHURCH WINDOWS The windows of Memorial church were carefully planned by the Rev. John N. MacGonigle, then pastor of the church, and Dr. Andrew Anderson, who was President of the Board of Trustees; They worked in close cooperation with the artist Mr. T. Schladermundt, of New York, who was commissioned to furnish the sketches. These three men consulted the architects, Messrs. Carrere and Hastings. Great thought went into these beautiful windows, the subject and what its relation would mean to the architecture of the church, the color of the windows and their effect on both inside and outside the church had to be weighed carefully. Dr. MacGonigle suggested that a subject symbolic of Christianity in its broader sense might well be considered. Finally the Apostles' Creed was chosen for the subject, inasmuch as people of all different churches worship here. The Apostles' Creed is used alike by Protestant, Catholic and Orthodox. The Venetian renaissance architecture with its narrow lancet windows made it impossible to use full pictures, so a composite Â’symbolism was decided as being the best way to portray the subject. A color scheme of the ten high, narrow windows which would keep the interior of the church in a single color tone was decided upon. The two broader windows and the rose window were treated independently. For the illustrations of the windows two sources were used: the traditional symbolism of the church and the symbolism of nature. Trees and flowers have always been a part of church symbolism. At the base of each window there is a panel with the article of the creed that window symbolizes upon it. The window depicting the "Crucifixion'' has the inscription "Was crucified, dead and buried;" the church symbol above it is the excelsus red cross, the purple passion flower is a symbol from nature. The passion flower is said to contain all the symbols of the Passion. The central column is a reminder of the scourging, and the spear-shaped leaf is symbolic of the weapon. The flower blooms for three days signifying the time Jesus was in the tomb. In the "Resurrection" window is an Easter cross, the church symbol, and for the nature symbol a sheaf of Easter lilies, both symbolizing the Resurrection of Jesus. The "Ascension" window has a crown, the church symbol of victory, and nature's symbol a palm tree signifying triumph. The "Judgment" window shows the church symbol of the scales of judgment and the roll of record. The laurel is always used to depict reward or victory. The "Holy Ghost" window has the church symbol of the descend ing dove, and from nature there is a cluster of pink orchids known as "The orchid of the Holy Ghost." The "Holy Catholic Church" window shows the seven branched candelabra, portraying the church and the tree of wild olives, symbol of faith. The "Communion" window with the holy cup is the church sym bol based on the Lord's Supper, and nature's symbol a cluster of grapes and leaves, meaning unity. "Forgiveness" is shown by the extended hand and the rays of light, and from nature the symbol of hyssop signifies absolution or cleansing from sin. The "Resurrection of the body" has the crossed palms, which is the church symbol for immortality, and from nature the Easter lilies, symbol of resurrection. The "Life Everlasting" window is symbolized by a hart drinking from a fountain, portrays the first verse of Psalm 42: "As the hart panteth after the water brooks, so panteth my soul after thee, O God!" The nature symbol shows the "Tree of Life", symbolic of Revelation 22:2: "The tree of life which bare twelve manner of fruits, and yielded her fruit every month; and the leaves of the tree were for the healing of the nations!" The letters on these panels were cut from opalescent glass and inserted in the windows, rather than being inscribed on the glass. The result is ideal, both as to the artistry of the lettering and in the fact the inscriptions are very easily read. The rose window in the East end with the sunburst in the back ground is the symbol of God the Father Almighty. The rose window in the chapel is of the head of Christ taken from the scene of "The Boy Christ in the Temple", by Hoffman. The violet tone of the windows in the choir loft produces an interesting effect against the golden tone of the eight large windows in the dome. The windows were made by the Decorative Glass Company, New York. Mr. Schladermundt was an exceptionally fine artist, some of his work is also in the Library of Congress in Washing ton, D. C. Shortly after completion some one remarked about the windows: "They stand for all that is highest and best; are an education and a recurring pleasure to this and will be to future generations." H. M. FLAGLER, Â“THE MAGICIANÂ” By LENA CLARKE A tangled wilderness, or trackless shore, Unused, untrafficked, spread beneath the skies This land lay, till it woke with glad surprise To see the long neglect of years was oÂ’er, And waste and wilderness should be no more; For one had come who read the future; wise And skilled to view the land with prophetÂ’s eyes, Who yielded freely, richly, of his store, And where undreamed of beauty slept before, His faith has been repaid with Â“Paradise.Â” From far and near there comes a joyful host, To share the glory of the land and sea, While prosperous towns and fruitful groves we boast, His name will be remembered gratefully, And will not he forgotten on ihis coast, Till Time is shadowed by Eternity.